I am the same as He. I have been looking for myself! Each human soul impregnated with "the Only Real Soul, the One" is born with infinite possibilities. But it takes millions of human beings to produce a refined soul who can get closer to the Real to such an extent that they can love in-sync and speak in-sync. Nearly 8 centuries ago, on September 30, 1207 such a person was born. Jelal-ad-Din Muhammad Balkhi who would later be know to the world simply as Rumi and who came to make great contributions to the Persian and world literature. A great poet and mystic whose name will always shine on the pages of history: Rumi's blessed birthday is today, 30th September. Rumi was born in Balkh in today's Afghanistan, then within the domains of the Persian Empire, and died on 17 December 1273 in Konya, present-day Turkey where he spent many years of his precious life. 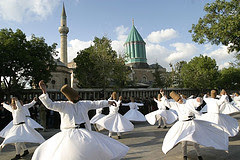 The dance of Whirling Dervishes called Sama is a part of the inspiration of Rumi which today is known as a part of the Turkish custom, history, beliefs and culture. Last year, the ritual was registered in the list of UNESCO's World Intangible Heritage. Sama represents a mystical journey of man's spiritual ascent through mind and love to a state of "Perfection." Rumi began his career as a preacher and theologian but after meeting a wandering dervish Shams-e Tabrizi, who turned out to be his spiritual guide, he became a mystic or Sufi. Rumi wrote the largest corpus of lyric poetry in the Persian language, amounting to 40,000. Although Rumi as known today in the west is of a more secular message bearer, but his message was in fact a religious one within the framework of Islam. Its not to be forgotten that he was a Muslim thoelogian, jurist and a professor. He lived the religion of islam inside out. Rumi brought Sufi mysticism away from asceticism and into the heart of the people. Many western fans of Rumi have secularised his message. It was in fact a religious one; and, says Prof Rohen, Christians and Jews as well as Muslims flocked to his funeral. mentions BBC article, The roar of Rumi 800 years on. Whenever people say that Islam is hostile to opposing views and violent in its nature, I always wonder whether those people actually ever took the time to read the Koran, to talk about it, to read other Islamic literature, to take a long and hard look at the history of this second largest religion of the world, and whether they’ve ever heard of someone we in the West have come to know as Rumi. Rumi's actual approach to Islam is clarified by the following quatrain composed by him: “I am the servant of the Qur'an as long as I have life. I am the dust on the path of Muhammad, the Chosen one. If anyone quotes anything except this from my sayings, I am quit of him and outraged by these words." In an article written by Seyyed Hossein Nasr entitled "Rumi and the Sufi Tradition," he states, "One of the greatest living authorities on Rûmî in Persia today, Hâdî Hâ'irî, has shown in an unpublished work that some 6,000 verses of the Dîwân and the Mathnawî are practically direct translations of Qur'ânic verses into Persian poetry." This year Turkey is to celebrate Rumi’s birthday with a giant whirling dervish sama performance with 300 dervishes and the celebration will be aired live in eight different countries using 48 cameras. 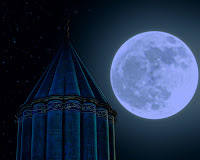 Translations of Rumi’s poetry brought this great Persian poet international recognitions such that he is recognized among the world’s leading figures in 2005 and 2006 and UNESCO has announced the year 2007 as the International Rumi Year. Perhaps the popularity of this great poet is rooted in the world’s quest for spirituality as Rumi’s poems reflect human’s quest for love. His words reveal beauty and ecstasy of Sufism. Rumi has attracted large disciples with his teaching, preaching and ecstatic or as the religion scholar, Karen Armstrong, puts it “Rumi’s spirituality is suffused by a sense of cosmic homelessness and separation from God, the divine source.” But thats not all. It's only apparanet that he speaks of longing and separation, but just beyond that is intoxication and bewilderment of union. His is not an unfinished tale of a broken heart, it's a legend of a most fulfilling and wondrous love. Rumi is all about merging with the Beloved. Rumi beckons us to sweet remembrance of God as the Ultimate Beloved, he shows us the path of awareness that merges individual soul into the Divine Soul. May Jelaladdin Rumi's noble soul be in peace and bliss with His Ultimate Beloved and may Rumi's word and message open the hearts of more lovers of God of all ages.